WWW.TIESPLANET.COM - The Blog: Mr. Men Turn 40! It is quite amazing but Mr. Men celebrate their 40th birthday today! Roger Hargreaves created Mr. Men when his son Adam asked what a tickle looks like. The rest, as they say, is history!!! 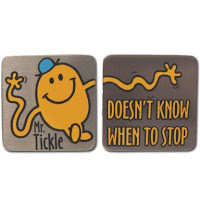 Those feeling nostalgic can buy Mr. Tickle novelty cufflinks at Tiesplanet.com.